Trade and economic issues, including visa, totalisation pact and impediments hampering investments, are likely to figure at Monday’s US-India CEO Forum meeting, which will be jointly addressed by visiting US President Barack Obama and Prime Minister Narendra Modi. Finance Minister Arun Jaitley and Commerce and Industry Minister Nirmala Sitharaman are also expected to attend the meeting, which among other things is likely to focus on ‘Make In India’ campaign and ease of doing business. State Bank of India Chairman Arundhati Bhattacharya, Oil and Natural Gas Corp (ONGC) Chairman and Managing Director Dinesh K Sarraf and BHEL head B Prasada Rao too are part of the 17-member Forum. The US team includes Indira Nooyi of Pepsico, Harold McGraw, Chairman McGraw Hill Financial and Ajay Banga, CEO Mastercard. Obama, who arrived in New Delhi on Sunday on a three-day visit, and Modi will interact with CEOs. The meeting is significant in the light of ‘Make-in-India’ initiative, which seeks to make the country a hub for global manufacturing, design and innovation. The bilateral trade between the countries stood at $61.64 billion in 2013-14. 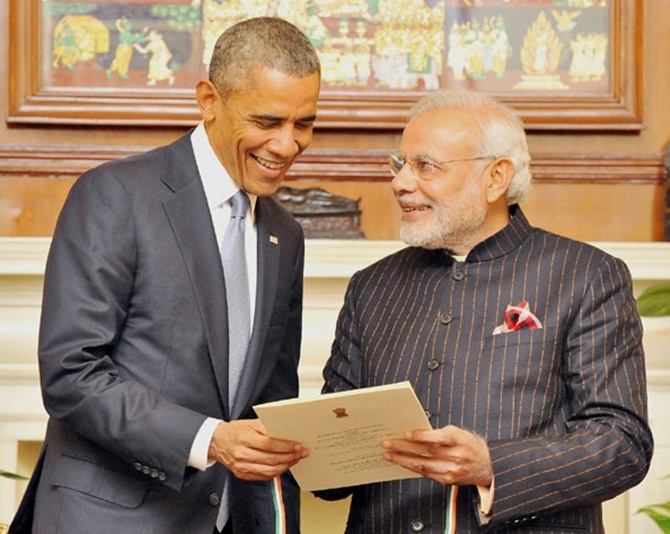 India has received $13.28 billion FDI from the US between April 2000 and November 2014. America is the sixth largest investor in India. Can Obama's visit lift India-US trade ties out of gloom?